In October, 2014 we sent out a survey on data sharing, and we got a great response (68 respondents). Thank you to all who took the time to fill it out. Here of some of the key results. 58% of people who responded have shared data or code in the past. 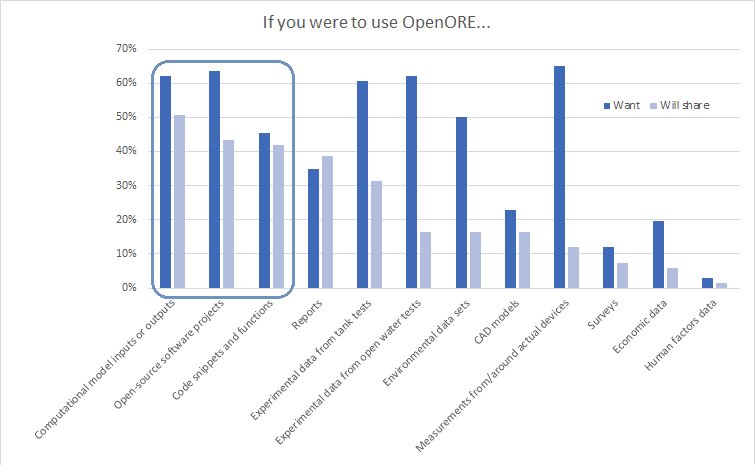 We asked the questions “If you were to use OpenORE, what type of data 1) would you be looking to find, and 2) would you share?” The top thing people want is “Measurements from/around actual devices”. Few people are willing to share this. However, the top 3 things that people would share relate to code. People both want and will share code! Many of the comments we received (and this is something that we’ve been thinking about) recommended that rather than trying to host data, OpenORE should be a directory of available code, projects, and data. The data could be freely available and hosted online somewhere else, or could be held by an organization who is willing to release it under certain circumstances (e.g. for academic research). For more info, see our About page. We also asked about the challenges with sharing code and data from both the ability to share and the ability to use perspective. Not surprisingly, the top issues with sharing data/code all related to concerns over intellectual property. This helps to reinforce our focus on research and academic data, where the IP issue may not be as big of a concern as in the commercial world. Furthermore, as we are not lawyers, it is beyond the scope of OpenORE to advise people on legal issues. Anyone considering sharing data needs to seek his or her own legal advise from within his or her own organization. We will give some references to information that can be found online, and our guidance is: always talk to your supervisor first. For more info, see our IP page. The top problem with using someone else’s data or code was the need for help and documentation. This is something we can do something about! In addition to being a directory, OpenORE will be a community forum, where users can ask questions, get answers, evaluate data/code and share their experiences. The survey is now closed, but we still want to hear from you! My name’s Siraj Sabihuddin. I’m a PhD. and I’m interested in linking our current SVN repository and grouping the data init with captions and other tutorial information (almost like a wiki) so that people, other than the developer, can find info that’s useful for them. Also interested in any work on electromagnetic physics, if people have worked with open source Electromagnetic FEA tools such as Elmer (or FEMM) … it would be great to see models, examples and tutorials (especially for Elmer). My name’s Matt Hall. I’m soon to be a PhD student at the University of Maine, working on floating offshore wind turbines. I would use openORE to share projects I’m working on, including an optimization tool and a utility for automating the creation of panel meshes for WAMIT that can be used inside an optimization loop. I would also like to use it to facilitate collaboration on a support structure optimization framework that I’ve been developing that I’d like to expand using other peoples’ expertise. I think it would be amazing if openORE facilitated the creation and/or sharing of open-source models (such as a dynamic mooring line model) that people could use in their various simulation tasks. I’m a PhD student at Oregon State University, and I would love to have a recognized and well used forum to distribute my code and data to people within my field. As researchers, we spend a lot of time duplicating the work of others, and although duplication is sometimes necessary, it would at the very least be nice to be able to check your work against that of someone else. The other problem I see is that after graduation, we tend to move on, and sometimes the projects we were working on die without anyone else to pick them up. Hopefully the forum will be a place where good ideas can live on and develop even without their originator. My name is Cameron McNatt. I am a PhD student at the University of Edinburgh. I would contribute MATLAB code to compute the linear wave field around a wave energy converter (WEC) and to compute WEC hydrodynamic array interactions. I would be interested in obtaining experimental wave tank measurements to validate my code and inputs and outputs of spectral wave models like SWAN, especially spectral wave models that include parametric WECs. My name is Alberto Pérez Ortiz. I’m an IDCORE EngD (Doctorate in Engineering) student doing my research project for University of Edinburgh and ALSTOM. In terms of how much I can collaborate and data I can share, I’m affraid I will be a bit more restricted than a normal PhD student, but in any case don’t hesitate to ask me. I have recently finished my PhD ‘Energy Harvesting for Marine Based Sensors’ and have since started working as a postdoc on a different project at a different institution . I would like to share a lot of the research and customised code developed throughout my PhD as I spent a lot of time and effort on these and they now sit idle on my laptop hard drive. Additionally I hope that this site can offer benefit to my current project through content shared by other researchers. I absolutely agree with Josh about wanting to share code that would otherwise not be exploited. I have already found shared code useful when using Matt’s optimization code on my oscillating water column model in MATLAB, which I will be happy to share when it has been tested. If anyone has physical testing data from OWCs, I’d be more than happy to look at that as well. By the way, I really like the tidal current animation, Alberto, and what appropriate music! Hi – Simon from ICIT (Heriot-Watt’s Orkney campus). Just a suggestion, especially where people are talking about sharing code rather than data – perhaps an OpenORE repository on Github (or similar) would encourage people to not only use code, but improve it and share their modifications. Hi Simon, that is definitely what we are thinking. In fact, each code submission will have a GitHub repository (rather than one large on for all of OpenORE). Thanks for your comment, please let me know if you have any more suggestions.